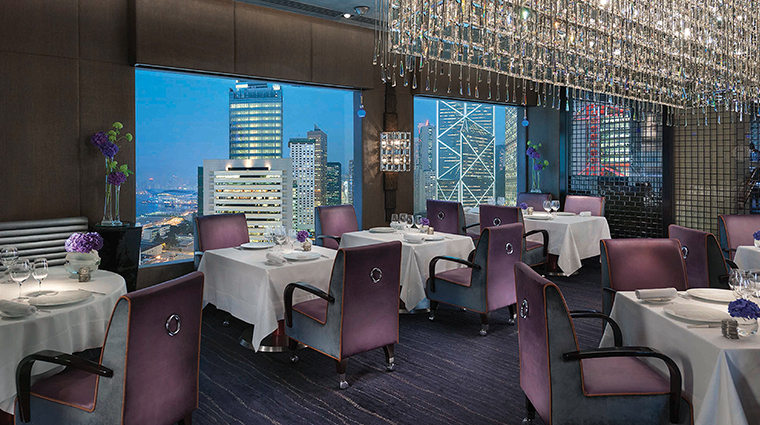 Bearing serious international accolades and glinting with innovation, Pierre Gagnaire’s Hong Kong home — the eponymous Pierre — can be found on the 25th floor of Mandarin Oriental, Hong Kong. 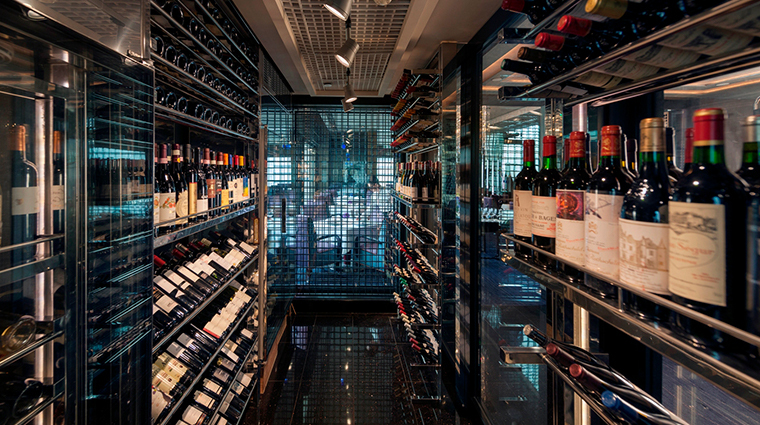 Guests filled with anticipation walk down the sleek, dark corridor that leads to the restaurant and wine cellar on the right or the private dining room to the left. With a quietly sophisticated design, the minimal décor is designed to make the most of the spectacular views over Hong Kong’s Victoria Harbor. The simple surroundings also highlight the equally dramatic dishes emerging from the kitchen, courtesy of chef Jacky Tauvry. 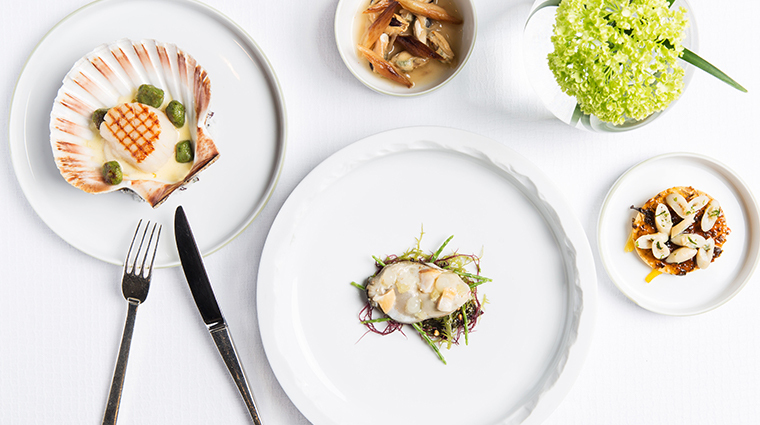 From an extremely reasonable one-hour express lunch to a leisurely dinner or multiple-course degustation, all of Pierre’s dishes present French cuisine in its most original interpretation, accompanied by an outstanding wine list. • Thanks to its prime location right in the middle of Hong Kong’s Central district, Pierre has enviable open views looking north across the harbor and east over Hong Kong Island’s mesmerizingly vertical, concrete jungle. 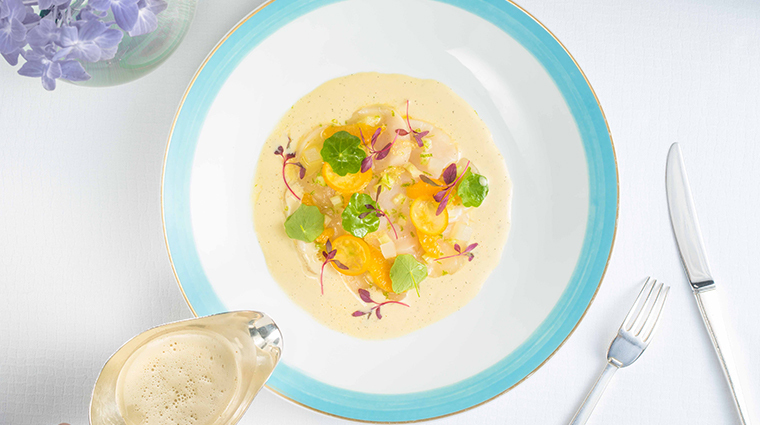 • Chef Jacky Tauvry’s talent is quite evident, even if you only have time for the express lunch menu, which includes dishes like the signature foie gras soup with pumpkin gnocchi, celery and pak-choi and the wild duck pie paired with a crunchy citrus salad. • Since Pierre is a highly acclaimed restaurant with an international reputation, it attracts well-travelled and sophisticated clientele—you never know who you might see here. • The striking interiors that make the most of blacks, grays, silvers and whites accented by a few choice pieces of Chinese art. Just a few splashes of color deliver an eye-catching contrast, via the contemporary flower arrangements and the changing hues of the central chandelier. • Gagnaire visits his Hong Kong restaurant three times per year to update the menu. Special offerings are made available while the chef is in town, and you may even be lucky enough to enjoy a greeting from the storied toque himself. 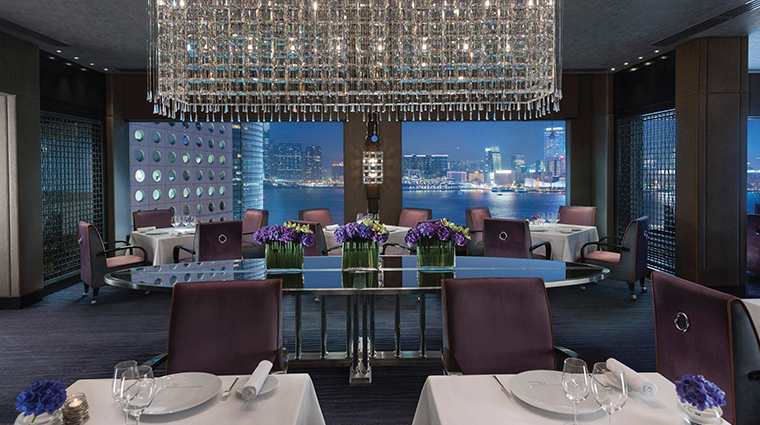 • Mandarin Oriental, Hong Kong’s Pierre is open for lunch and dinner six days a week. Pierre serves lunch from noon to 2:30 p.m. Monday through Friday. Dinner is service starts at 6:30 p.m. and lasts until 10:00 p.m. Monday through Saturday. • Please note that the restaurant is closed on Sundays and public holidays. 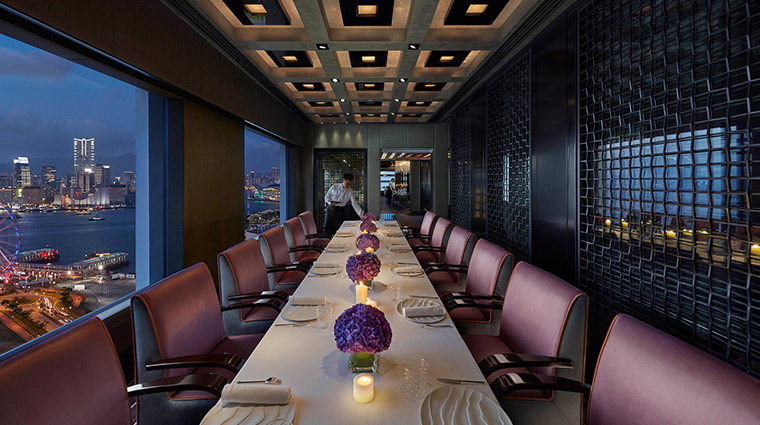 • While the dress code at Pierre in Mandarin Oriental, Hong Kong is described as smart casual, guests are requested not to wear anything too casual. This list of sartorial no-no’s includes short pants, short sleeves for men, sportswear, T-shirts or open shoes for men. • The popular restaurant is often fully booked, so you are encouraged to make advance reservations for both lunch and dinner. Book your table by calling (852) 2852 4001, emailing mohkg-pierre@mohg.com with all the details about your party or by visiting the hotel’s website. 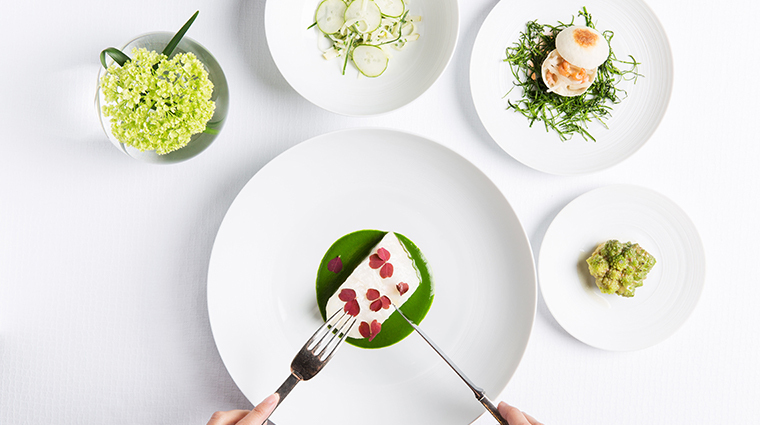 • At just 29 years old, Brittany native Jacky Tauvry helms the kitchen at the internationally acclaimed Pierre at the Mandarin Oriental, Hong Kong. 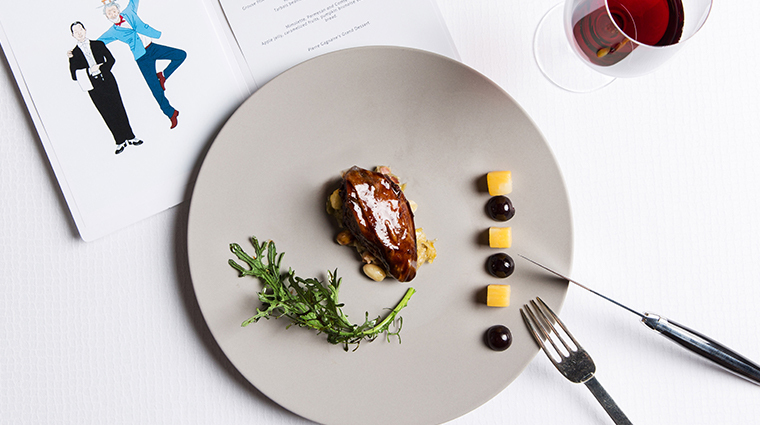 • Chef de cuisine Tauvry spent four years working with Pierre Gagnaire at his award-winning Paris restaurant before coming to Hong Kong as the sous chef of Pierre. 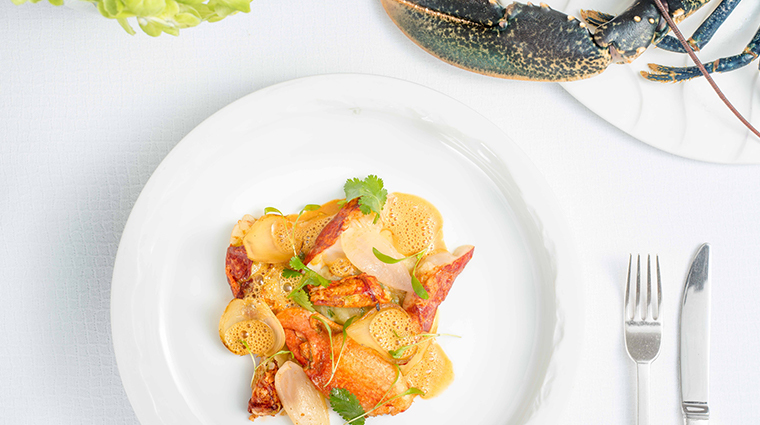 • Having spent another five years working side-by-side with the restaurant’s former chef de cuisine, Jean-Denis Le Bras, Tauvry was the natural choice to take over the helm of the much-loved Hong Kong eatery. • Inspired by his love of the arts, chef Tauvry frequents museums and art galleries around the world. 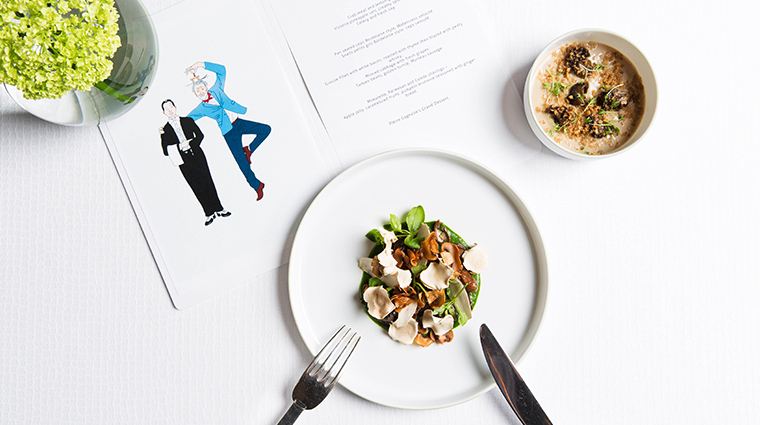 Through his love of art, he is able to emulate Pierre Gagnair’s artistic design and creative dishes that keep guests coming back again and again.